I apologize for being somewhat off my pace of getting out posts recently, it has been mostly because I’ve put in 3 weeks in a row of 60+ hour work weeks. And then, over this weekend, we traveled to Brighton to be with our daughter Nellie as she gave birth to our second grandchild - a baby boy on Friday (4/16)! Rita stayed behind to help the family out while I had to return this evening. Now that RVL has resumed his teaching series, I need to get back on schedule and get us up to date. Part 5 was a particularly moving session for me. After doing his usual introduction and review, Ray introduced the Hebrew word zachar, which means to remember. But zachar is not just recalling facts, it is reliving the drama. He told a story about remembering. Though Ray was born in the Grand Rapids area, he taught for several years in New Jersey. Then, 20 years ago he came back to the area to be a high school teacher at Holland Christian, which has a sizable complex across the street from Central Wesleyan. Five years ago, on April 15th, Ray had heart bypass surgery and is glad to be alive; it is here where I could identify. Five years ago, on April 5th, I had quadruple bypass surgery in Ann Arbor and I’m glad to be alive too! He came to the point where he realized his life was in His hands (and I did so too). The Biblical God defeated the gods of Pharaoh by the finger of God. Many of the miracles in the Gospels are addressed against demons; Jesus’ reference to the finger of God is a direct link to this time. The Pharaohs claimed to be Amun Ra. The animal that was often used to symbolize Amun Ra was a sheep. Ray showed a slide of a large statue that showed Pharaoh standing under the chin of a sheep. The Hebrews were despised in part because they ate sheep! God/Moses had told the Israelites to pick a sheep on the 10th day of the month and to bring it into their home for 4 days to observe that it was without blemish. At this point, Ray shifted to the 10th day of the Passion week. Jesus was the lamb of God and he wanted Israel to pick him as their lamb. He came from Bethpage to the Mount of Olives on the 10th day of the month and presented himself. 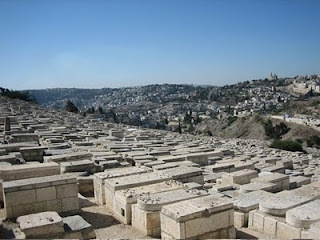 Ray showed pictures of this area that brought back many memories to me, since I too walked down the narrow road with 5 foot high walls that descends from the Mount of Olives. 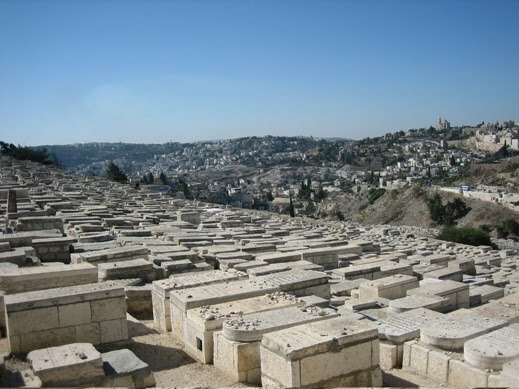 On the left is a vast Jewish cemetery where countless stone burial vaults face the Temple mount, awaiting the return of the Messiah. Captivating the scene was the golden Dome of the Rock that glittered behind the restored city walls that ring the mount. The famous Golden Gate stands there, blocked-in and shut, also awaiting the time when the Messiah will walk through it in the future envisioned by Ezekiel. Though Jesus hoped the people would see him as their Passover lamb, he was greeted by Palm branches which was the symbol used by the zealots. They chanted Hosha - Na: Save us! from the Romans. Not save us from our sins! Jesus was riding on a donkey representing the humbler half of the prophecies tied with Mashiach: ben Yoseph. But the people wanted Mashiach ben David, who will come in power on a white stallion. Ah, but he will - at another time, another advent. This is when Jesus wept over Jerusalem, lamenting that they did not know the time of his coming. It is the 10th day of the month: lamb selection day, which hearkens back 1400 years to the Exodus story. The Israelites were to kill the lamb in front of their house on the 14th day. Ray showed an artist’s rendition of a street in Goshen, where every home had a slain lamb in front, with blood on the street and red blotches on their doorposts and lintel. We lose the impact of this, because the idea that you would kill Egypt’s sacred animal and put its blood on your home was risking your family’s life! God does that with his people often. “I will stop the Jordan river from its flood stage rush when the priest’s feet get wet as they carry the ark across. I’ll split the Red Sea when Moses rod plunges in and there is no where else to turn..." At midnight the death angel came through Egypt and everyone stayed up that night with God. This made such an impact on the people, that staying up all night on Passover became a part of the festival. Exodus 12:42) "Because the LORD kept vigil that night to bring them out of Egypt, on this night all the Israelites are to keep vigil to honor the LORD for the generations to come." Psalm 121:4 "Behold, He who keeps Israel shall neither slumber nor sleep." ”And He took with Him Peter and the two sons of Zebedee, and He began to be sorrowful and deeply distressed. Then He said to them, ‘My soul is exceedingly sorrowful, even to death. Stay here and watch with Me." WATCH WITH ME. Why these words? What night is it? It is the 14th day of the first month when the angel of death is lurking about and Jesus was about to meet him in the garden. The blueprint for this was drafted in Egypt. In the Passover seder there are four cups of wine. Do you know what cup Jesus was referring to that became the basis for what we now call communion? It is the third cup, the cup of redemption (each of the four has a name). The fourth cup is the cup of protection, but Jesus said he would not drink of that cup until he drinks it anew in the Kingdom. And then they sang a hymn and went to the Garden of Gethsemane. 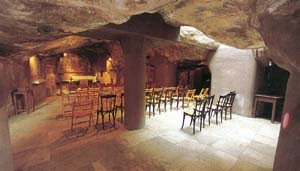 Ray showed slides of a place in Gethsemane that I remembered well. The tour guide on our trip took us to see the olive groves on the mount but wasn’t going to show us much else. I had a BAR magazine with me that had an article about a likely place where Jesus would have spent the night on the Mount of Olives. I showed it to him and he consented to bring me to the spot. As Jesus took our sin upon himself, he experienced the wrath of this 5th cup in isolation from the Father.